Happy St. Patrick’s Day! As you know by now, I love to make cupcakes for almost any occasion. St. Patrick’s Day has always been a favorite holiday of mine for may reasons. Mainly it’s all about green; just take a look at my logo to know I love green. 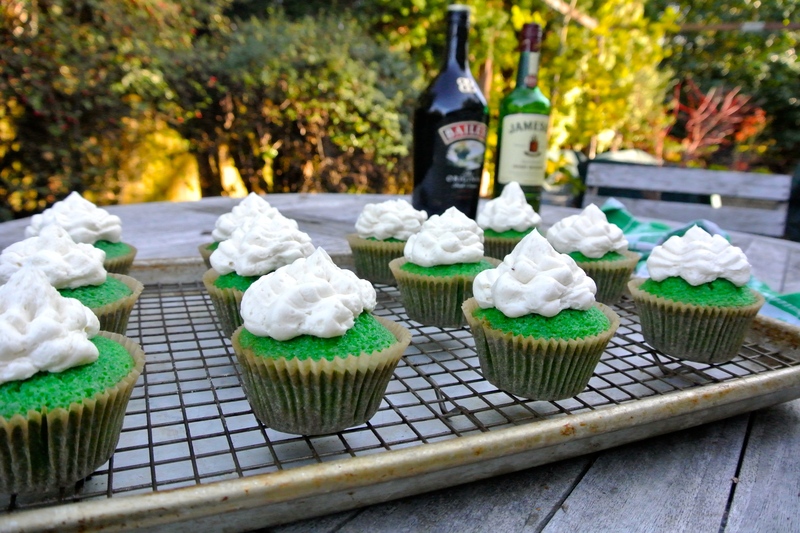 I thought this year I would make green cupcakes for my monthly happy hour, which will feature all kinds of Irish treats. 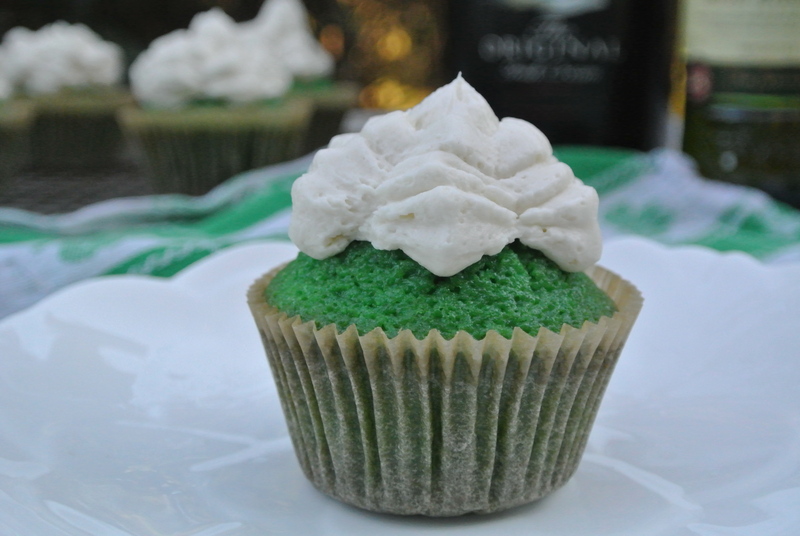 You can’t just make green cupcakes and call it good — they need to have some sort of Irish flavor. This is how I came up with my Baileys white chocolate chunk cupcakes soaked in Irish whiskey. They’re topped with a Bailey’s Irish cream frosting. Perfect for St. Patrick's Day! Leave out the green food coloring and they are great year round! Sift the flour, baking powder, baking soda and salt together. Set aside. Add the vinegar to the milk and set aside. Cream the butter and sugar together until fluffy. Add one egg at a time to the mixer until incorporated. Add the Bailey’s, alternating between the flour mixture and the milk, until all is combined. Don’t over mix. Add as much green food coloring as you’d like to make the desired shade of green. Gently stir in the white chocolate chunks. Pour batter into a cupcake lined tin. You want each to be ¾ full (make sure each has some of the white chocolate). Remove from the oven immediately and with a brush, brush each cupcake top with a generous amount of the Irish whiskey. I like to brush each cupcake twice to get an extra amount into each. Set aside to cool. Cream the softened butter and shortening together. Add in the powdered sugar in batches until combined. Slowly pour desired amount of Bailey’s into mixture. Next, pour ¼ cup of heavy cream into mixer and turn up the speed so that you whip the cream. Keep the mixer on and add remaining ¼ cup of cream and whip until you have a soft and fluffy frosting. You can either frost with a flat-sided spatula or pipe the frosting on like I did. Either way works great because the flavor of these cupcakes will send you over the rainbow into a pot of gold! You can make these in mini cupcake form too! The batter yields about 48 mini cupcakes and they come out perfect if you bake them for 15 minutes! How good is that?